Lego has unveiled a set of figures celebrating the women of NASA. The 231-piece set features Sally Ride, the first American female astronaut, and Mae Jemison, the first black woman to travel in space. 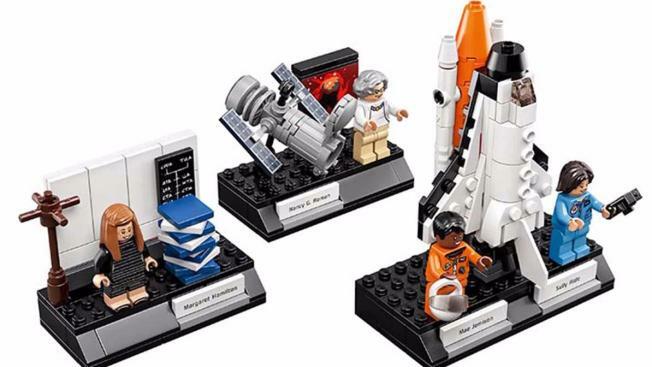 Also included in the set are figures of astronomer and educator Nancy Grace Roman and computer scientist Margaret Hamilton. Lego versions of the Space Shuttle Challenger and the Hubble Space telescope can be put together with the set. A miniature version of Hamilton's workspace at the Massachusetts Institute of Technology as she was programming software for the moon landing is also featured. The set is the brainchild of Maia Weinstock, an MIT employee who proposed a women-of-NASA collection through the Lego Ideas program. It was under the headline "Ladies rock outer space." The set retails for $24.99 and goes on sale Nov. 1. It’s recommended for ages 10 and up.